Is it OK to observe babies in their nest? Do baby birds have to be taught to fly? Do birds use birdhouses in winter? It can be hard to lure a trapped bird out of an attic, chimney or room. The key is to make it brighter outside the room than inside, because the bird will navigate to the brightest area. If it’s in an attic, turn off the attic lights and turn on all the room lights. Make the room as bright as possible and close all the doors. Eventually, the bird will be drawn to the brightness. If you’ve opened windows (assuming it’s sunny outside), perhaps the bird will just fly straight from an attic or chimney and out through a window. That may be too hopeful — so, if it doesn’t, dim the room lights and pull the shades on all but one or two open windows. The bird will be stressed, so give it some time to find its way out. You can also try to catch a bird by throwing a towel over it as it perches or if it gets cornered. Then carefully scoop the bundle up and release the bird outside. Or, you may be able to pick up a cornered bird with your hands. Fold its wings against its body and cradle it in your hands, as you see in the photo above. Be gentle, birds are fragile, with legs not much thicker than a toothpick. Place bird feeders and birdbaths at least 25 feet from windows. This gives birds room to change course or apply the “brakes” when they realize what’s ahead. Or, place bird feeders and baths within 2 or 3 feet of windows. This prevents them from gaining enough speed to cause injury. Decals may help. Those such as Window Alert, shown here, seem to work best. Apply them to the outside of windows. 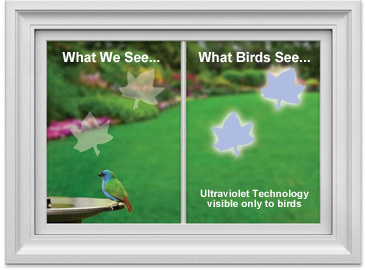 They have a coating that reflects ultraviolet sunlight — it glows for birds, but isn’t visible to humans. You’ll need more than one decal per window. Mylar reflective strips pinned at the top on the outside of windows will move in the breeze to help alert birds. David Sibley, noted bird guide author and illustrator, suggests trying this. It isn’t foolproof, but may help: Draw X’s using a yellow highlighter on the inside of windows. The fluorescence of the highlighter is visible to birds. It works best in sunlight and not very well on cloudy days or low light. The bird is highly vulnerable while it’s recovering, so keep an eye on it until it rallies and flies away (usually an hour or less). If you have pets, keep them away. A good way to safely contain a bird while it recovers is to place it in a small paper bag with paper towels on the bottom (don’t shred the towels.) Secure the top, but cut a few small air openings in the bag, and place it in a quiet, darkened room where it’ll be safe. Make sure the bird’s movements can’t topple the bag onto the floor. Check it periodically; if the bird acts feisty and tries to get out of the bag, it’s probably time to release it. Take the bag outside, reach into the bag and grab hold of it (hold its wings folded next to its body to keep them from becoming damaged). Or you can slowly turn the bag on its side, open it and allow the bird to find its way out. Release it at ground level rather than throwing it into the air. If it still seems stunned, keep it safe another hour. If it’s still not well by then, call a licensed wildlife rehabilitator. If you’re able to peek into a nest, do it, it’s just too tempting to resist. But don’t do it too often, and only when the parents are away. Bird parents are very devoted to their young and will tolerate some disturbance. Too much, however, and they’ll feel forced to abandon them. How much is too much? You won’t know until it’s too late. So, peek a few times, but, otherwise, watch the bird family’s activity from a distance. By the way, you shouldn’t touch the babies, but it isn’t true that human scent alone will make the parents abandon them. 1. Is it featherless or nearly so? Is it alert and opening its mouth (indicating hunger)? If so, put it back in its nest, if possible. It’ll probably be under the tree from which it fell. If it can’t be returned, build a makeshift nest out of a butter tub lined with grasses. (Be sure to poke some holes through the bottom for water drainage.) Secure the tub to the tree as close as possible to the original nest and place the baby in it. Keep an eye on the new nest to see if the parents find it. They’ll probably carry food to both nests. If after an hour the parents haven’t returned or are repeatedly ignoring cries from the new nest, wrap the baby in a soft cloth, keep it warm, and transport it in a box immediately to a licensed wildlife rehabilitator. 2. Does it have feathers? If the bird has most of his flight feathers, it’s a fledgling that has voluntarily left the nest. It’s still growing its feathers and will spend a week or more on the ground while learning to fly. Its parents will watch over it and continue to feed it. If it’s exposed, like in the center of a turf area, gently pick it up and place it on one of the lowest branches of a nearby shrub, then move away. It’ll cry out when you grab it and you may find yourself being dive-bombed by its parents! It may run from you into grasses or under shrubs, which is just fine, because there it’ll be hidden from predators. 3. Is it a ground-nesting bird? Some birds are supposed to be on the ground. 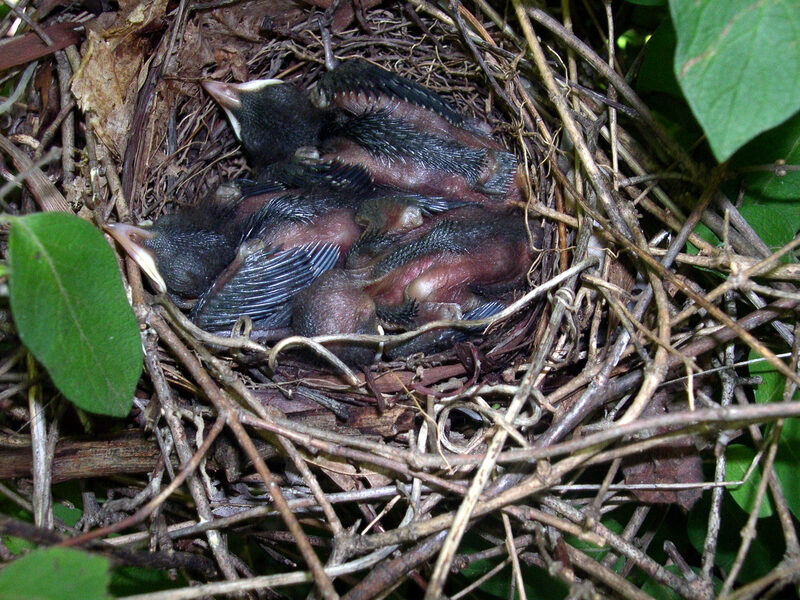 Although we may be more familiar with birds that nest in trees, there are species that nest on the ground. “Precocial” species are feathered from the moment they hatch. Although not able to immediately fly, they start following their mother around and they’re able to feed themselves. Killdeer, sandpipers, Whip-poor-wills, Nighthawks, quail and pheasants are some of the birds that do this. So, unless the foundling is visibly ill — can’t stand or peeps weakly — it’s best to leave it be, its parents are probably watching. Take care not to leave your pet (especially a cat) outdoors while a fledgling is on the ground. Keep a rescued bird warm, but not too warm, as they can quickly overheat and die. You can warm a nestling by cupping it in your hands until you feel its body warm up, then place it in a warm, quiet room in a container lined with soft cloth or paper towels. Keep it warm with a hot water bottle, or even two bottles filled with warm water, one placed on each side of the bird. Take care not to heat the water warmer than you would a baby’s milk bottle. You can help a rescued nestling survive while getting it to a rehabilitator by giving it three to four bites of canned dog food on the tip of a toothpick and one drop of water every hour. You don’t need to hold the bird. If it’s healthy, it’ll hold its mouth wide open. Place the food on the back of its tongue. If you do hold it, don’t lay it on his back, which could cause it to inhale the food or water. Take care if the foundling is a bird of prey (raptor). Raptors are carnivorous, many are very powerful, and they’re all equipped with sharp — razor sharp — talons. Their beaks are designed for killing and for tearing flesh — including a human’s. Wear thick leather gloves when dealing with a feathered raptor, restrain his feet and keep feet and beak away from you. Leave a fledgling on the ground for its parents to tend to, but try to return a partly feathered or down-covered raptor to its nest. Either way, beware of its parents. It may be difficult to find the nest —many raptors place them so high in trees they can’t be seen, or at least too high to reach. 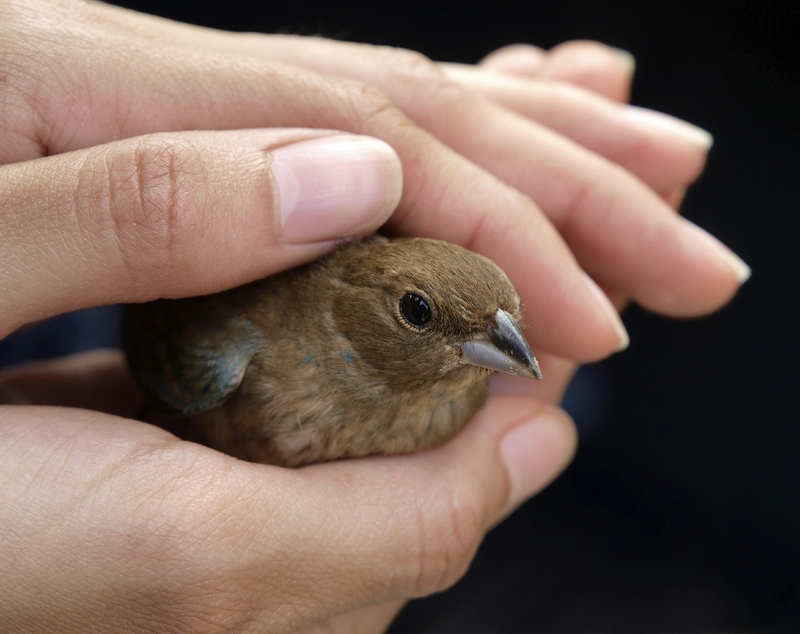 If returning a baby to its nest is hopeless, call a licensed wildlife rehabilitator. Birds instinctively know how to fly. When a young bird leaves the nest its feathers aren’t completely grown, but it’ll optimistically take flight in a great leap of faith in its ability to go airborne. It simply takes a hop and spreads its wings. It will take awhile to get the hang of it and it may first fly only a few feet and plop to the ground. But it’ll hone its skills over the next few days. The parents will carefully watch over their little offspring and bring it food for a few days up to a few weeks, depending on the species. You can tell when a bird is nearly ready to leave its nest, as you’ll see it hanging halfway out of its birdhouse opening or perched on the rim of its nest. They fluff their feathers to trap air (which provides insulation), tuck their feet and legs into their breast feathers, and shiver to generate body heat. They also roost together to pool body heat (as many as 10 bluebirds have been found together in one tree cavity.) Some species enter a state of sleep called torpor, which is deeper than normal sleep, but less deep than hibernation. 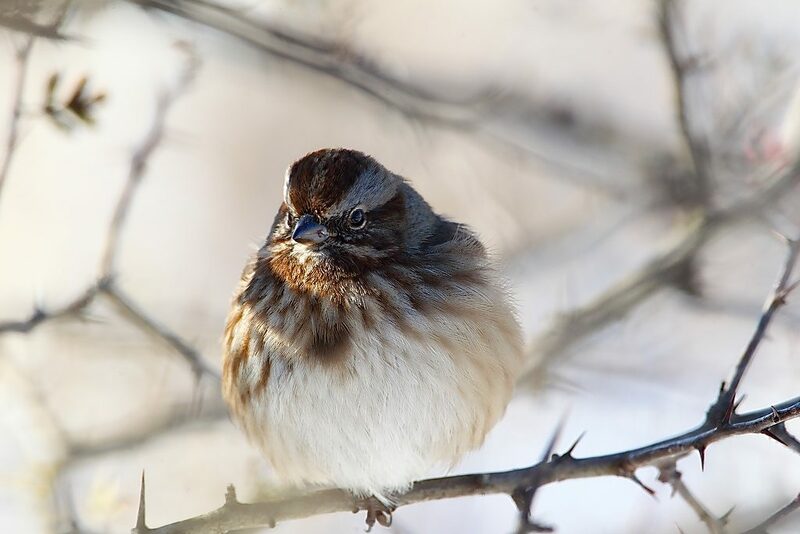 In torpor, the bird’s body temperature drops and metabolic rate slows in order to conserve heat. Some birds will use them. The National Wildlife Federation suggests that, in winter, birdhouses be mounted 10 feet or higher on poles to protect them from predators, such as raccoons. Be sure to block the ventilation holes loosely with foam weatherstripping (and also be sure to unblock them in the spring). Don’t block out all light, as birds don’t like to enter pitch-dark boxes. For winter, a larger than usual entrance seems to be preferred.